"Miss Brooklyn" would be huge. 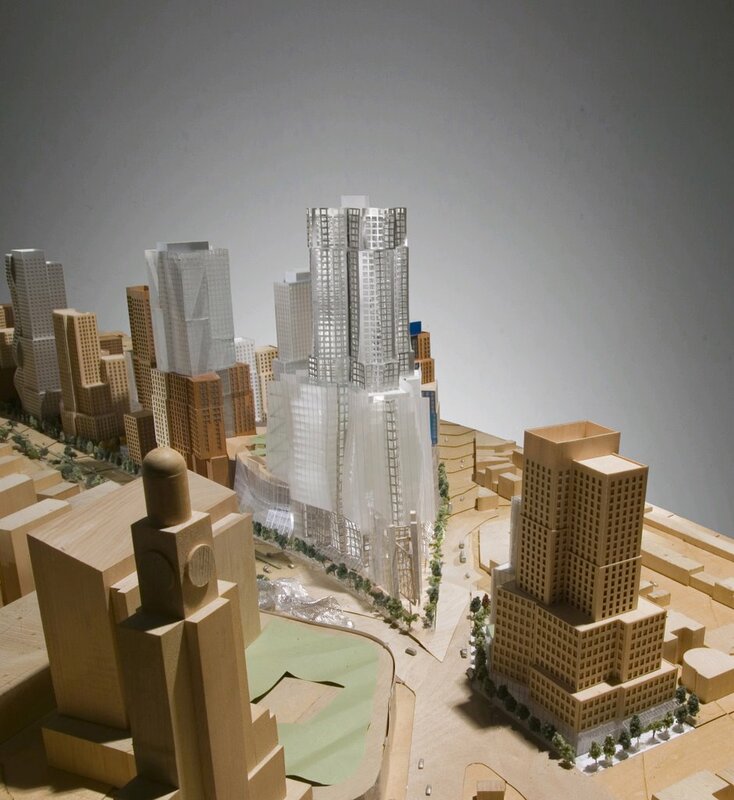 While it would be the only building in the Atlantic Yards project taller (by about 20 percent) than the Williamsburgh Savings Bank nearby, architect Frank Gehry's flagship tower would be three times larger than the iconic bank, in square footage. 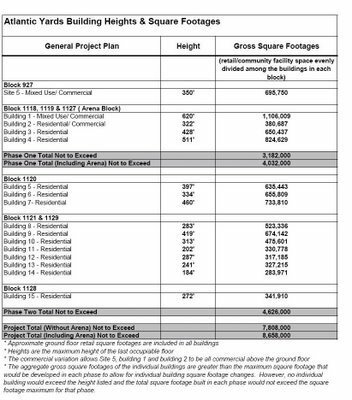 In fact, ten of the 16 buildings planned, including each of the five slated for the first phase, would be bigger than the bank, in bulk. Developer Forest City Ratner has regularly cited the bank as a cue for the size of the Atlantic Yards project. It even released a rendering (below right) from a perspective that shows the bank looming over "Miss Brooklyn" in the background. 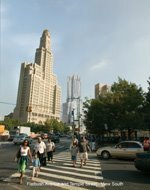 Miss Brooklyn," the building proposed to be located at the corner of Flatbush and Atlantic Avenues, will be the tallest, at 620 feet. As a comparison, buildings located nearby include the Williamsburgh Savings Bank which stands at 512 feet. But height is only one measure. 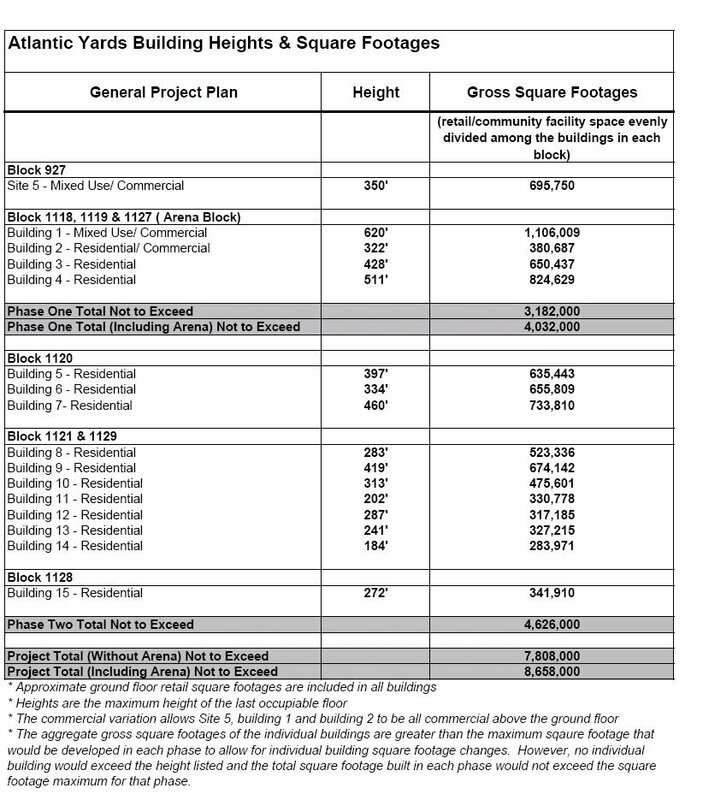 A document listing square footages, released by the Empire State Development Corporation last week as part of the General Project Plan, shows how bulky the buildings would be. "Miss Brooklyn" would contain more than 1.1 million square feet. The bank, which is under conversion to luxury housing, contains 362,269 square feet. Among the other buildings in the first phase, the building slated for Site 5, currently home to the low-slung P.C. Richard and Modell's, would be 695,750 square feet, nearly twice as big as the bank in terms of bulk. In the graphic at the top, this building is on the right.